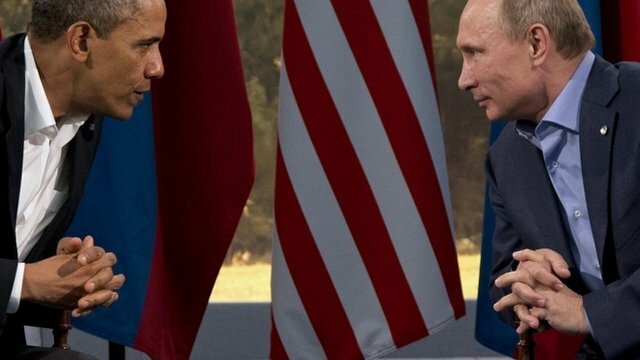 Vladimir Putin has warned America and its allies against taking one-sided action in Syria. The Russian president said any military strikes without UN approval would be “an aggression”. President Barack Obama has called for punitive action in response to an alleged chemical weapons attack. Vladimir Putin said Russia did not rule out supporting a UN Security Council resolution authorizing force, if it was proved “beyond doubt” that the Syrian government used chemical weapons. On Tuesday evening, members of the Senate Foreign Relations Committee agreed on a draft resolution backing the use of US military force. The measure, to be voted on next week, sets a time limit of 60 days on any operation. According to the draft resolution, the operation would be restricted to a “limited and tailored use of the United States Armed Forces against Syria”, and ban the use of any ground forces. The US has put the death toll from the alleged chemical attack on the outskirts of Damascus on August 21 at 1,429, though other countries and organizations have given lower figures. Vladimir Putin was speaking ahead of the G20 summit in St Petersburg, which opens on Thursday and is supposed to concentrate on the global economy, but now looks likely to be dominated by the Syrian crisis. In a wide-ranging interview with The Associated Press and Russia’s state Channel 1 television, Vladimir Putin said it was “ludicrous” that Syrian President Bashar al-Assad, an ally of Russia, would use chemical weapons at a time when it was gaining ground against the rebels. “If there is evidence that chemical weapons were used, and by the regular army… then this evidence must be presented to the UN Security Council. And it must be convincing,” Vladimir Putin said. But in what correspondents say is an apparent change in stance, Vladimir Putin said Russia would “be ready to act in the most decisive and serious way” if there was clear proof of what weapons were used and who used them. Vladimir Putin said it was “too early” to talk about what Russia would do if America took action without a UN resolution. He confirmed that Russia had currently suspended delivering further components of S-300 missile systems to Syria. The US Congress is expected to vote next week on whether to back President Barack Obama’s push for military strikes in Syria. Ahead of next week’s vote in Congress on whether to back military strikes in Syria, US Secretary of State John Kerry appeared before the Senate Foreign Relations Committee on Tuesday to promote the Obama administration’s case.